Edmonton’s Jesse Puljujarvi: Forgotten But Not Gone? There were several hotshot teenagers selected in the 2016 NHL Entry Draft who were hailed as can’t-miss prospects. Jesse Puljujarvi was one of them. 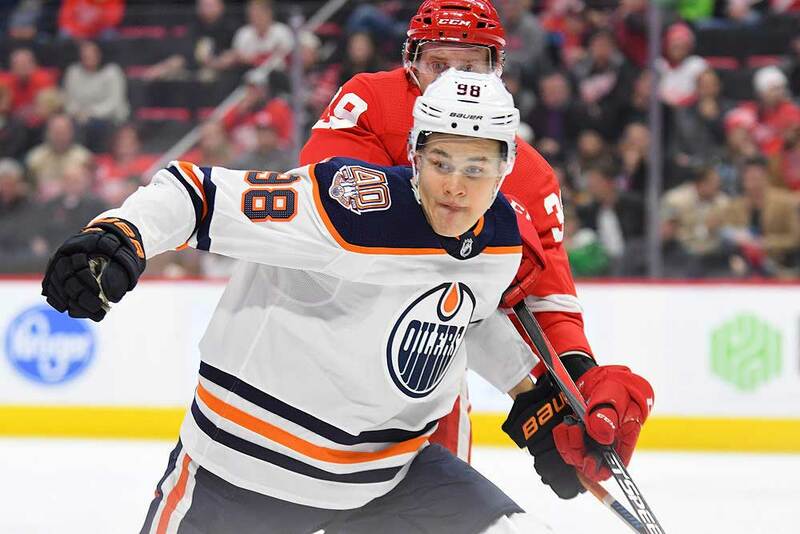 However, the Edmonton Oilers and some of their fans are wondering if the young winger was somehow miss-labeled prior to the team taking him in the first round that summer. That was one of the rare years the Oilers didn’t win the draft lottery and had to settle for choosing fourth overall. Auston Matthews and Patrik Laine were expected to be the first two players selected in most experts’ eyes, but some of them made a case for Puljujarvi as they felt he had the skills to eventually be the best of the bunch. Matthews went first overall to the Toronto Maple Leafs and was followed in quick succession by Laine to the Winnipeg Jets and in a bit of a surprise move, the Columbus Blue Jackets chose Pierre-Luc Dubois with the third pick. The Oilers then took the much-heralded Puljujarvi fourth. Puljujarvi is just 20 years old, but some fans are starting to second guess the Oilers since he had produced just 17 goals and 35 points in his first 129 NHL outings as of Jan. 18th. This includes four goals and three assists in 36 contests this year along with a minus-11 rating. It’s not really headline news that Matthews, Laine and Dubois have outscored and outperformed Puljujarvi in their NHL infancy. But what is understandably concerning to Oilers’ fans is the list of players drafted after him who have made better starts in their big league careers so far. This includes fellow first-rounders Matthew Tkachuk (Calgary Flames), Clayton Keller (Arizona Coyotes), Mikhail Sergachev (Montreal Canadiens), Tyson Jost (Colorado Avalanche), Charlie McAvoy (Boston Bruins) and Jakob Chychrun (Arizona). There are also a couple of second-rounders from 2016 who have adapted much better to the NHL such as Alex DeBrincat of the Chicago Blackhawks and Samuel Girard of the Nashville Predators. And let’s not forget Jesper Bratt of the New Jersey Devils who was selected 162nd overall. Puljujarvi definitely isn’t the only 2016 first-rounder to still be seeking consistency in the NHL, but he’s currently the 13th-highest scoring player from the draft and since he was taken fourth it doesn’t sit too well with some fans. With the Oilers previously drafting successful trigger men such as Taylor Hall, Ryan Nugent-Hopkins, Connor McDavid, Leon Draisaitl, Jordan Eberle and Sam Gagner in the previous decade, Puljujarvi is more or less being compared to the underachieving Nail Yakupov. Yakupov was drafted first overall in 2012, but even he managed 28 goals and 55 points in his first 111 NHL games compared to Puljujarvi’s 35 points in 129 outings. In the Oilers game against the Vancouver Canucks on Jan. 16, Puljujarvi played a season-low 6:09 minutes of ice time and received just nine shifts while skating on a line with Jujhar Khaira and Colby Cave. A couple of weeks earlier he was given a shot on the top line with McDavid and Nugent-Hopkins as head coach Ken Hitchcock tried to jump start his season. But it seems things may get worse for Puljujarvi before they get better as Hitchcock is running out of ideas. It’s hard to blame the coach though considering the Oilers are in a dogfight to make the playoffs. But according to Tommi Seppala, a sportswriter with Yle.fi in Finland, he believes Edmonton hasn’t handled Puljujarvi properly. The player doesn’t agree with him though since Puljujarvi said he needs to earn his ice time simply by performing better, especially when it comes to his defensive responsibilities and physical play. But it all leads back to the famous what-came-first conversation; the chicken or the egg? Puljujarvi obviously feels he’d play better with more ice time whereas Hitchcock will gladly play him more if he performs better. As well as trying to find his feet on the ice, Puljujarvi now has to deal with the off-ice distractions of the game as he admitted to hearing all of the trade rumors concerning him. Recent media reports have listed Vancouver and Columbus as being possible trading partners with the Oilers regarding the youngster. It’s obvious Puljujarvi is developing at a slower rate than many of his peers and that’s what’s frustrating some fans. He has the size to excel since he’s 6-feet-4-inches tall and weighs 210 lbs. He’s also a fine forechecker with a good shot, work ethic and vision, but he’s still growing into his body. In addition, he’s more or less just a kid who was born in Sweden and grew up in Finland. He was still trying to learn the English language in his draft year and adjust to his new surroundings and culture. Puljujarvi now feels more comfortable in North America and has become “one of the guys” in Edmonton. It’s no secret that former Oilers’ coach Todd McLellan didn’t think Puljujarvi was ready to handle the rigours of the NHL game, but Hitchcock believes he’s just maturing at a slower rate than many others and is starting feel at home. There’s no doubt Puljujarvi possesses the skills and work ethic to succeed in the NHL, but at the moment he’s lacking in self confidence. He may gain it sooner rather than later, but if it doesn’t arrive before the current season’s over patience may grow even thinner with some Edmonton fans. Perhaps all Puljujarvi needs is more time to prove himself or a change of scenery via a trade. The latter could be a mistake though considering he’s just starting to come out of his shell with his teammates.